What's My Entertainment Memorabilia Worth? 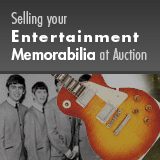 Our experts will evaluate your Entertainment & Music Memorabilia for auction or private treaty sale. Since the late 1970s, the notion of collecting memorabilia associated with the field of entertainment has grown by leaps and bounds. Now, Entertainment Memorabilia is recognized as an important collectable category with prices realized continuously growing in such areas as autographs, costumes, props, set pieces, rare photographs, and other important artifacts from the fields of film and television. Music memorabilia, especially those pieces associated with Rock and Roll, Blues, and Jazz icons have achieved soaring results in both prices and escalating interest. Stage-worn costumes, performance-used instruments, music posters, autographs, hand-written lyrics, rare records, and awards are fast escalating in value. This field is on an upward spiral for both the avid collector and the shrewd investor. Provenance is always key when dealing in Entertainment Memorabilia. 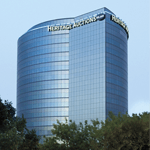 We at Heritage, diligently seek provenance by tracing the previous ownership of each item in order to be assured that the piece is authentic and that we offer nothing but the best and most credible entertainment memorabilia. Owning an item that is directly linked to your favorite artist is exciting, interesting, and profitable. That piece of memorabilia represents a moment in time when your favorite Icon was there, and the connection can be almost spiritual. What Kinds of Memorabilia Are We Looking For? Autographs of entertainment icons: From the field of entertainment, names such as Bogart, James Dean, Marilyn Monroe, Marlon Brando, Katharine Hepburn, Judy Garland, John Wayne, Montgomery Clift, and other superstars always get good prices. Character actors from classic films such as The Wizard of Oz, Casablanca, Gone With The Wind also command keen interest. Vintage autographs from early stars of the Universal Golden Age of Horror are also eagerly desired by ardent fans and collectors. From the world of music, names like Buddy Holly, The Beatles, Sam Cooke, Elvis, The Rolling Stones, Hendrix, Joplin, Jim Morrison, Otis Redding, Charlie Parker, John Coltrane, Huddie Ledbetter, Robert Johnson, and Stevie Ray Vaughan will always be good investments and rewarding collectibles. In all areas of entertainment, the scarcity of the autograph, due to reclusiveness of the artist or tragic/premature death, make the value much higher. The simple laws of Supply and Demand should always be a guideline for the smart collector. After a stint in the corporate world, Garry Shrum started his own successful record store, Blue Meanie Records, in 1976, and he's been immersed in records, tapes and CDs ever since. Attending many record shows in the United States and Europe over the years, he has become an expert on imports, especially those of the 1960s. 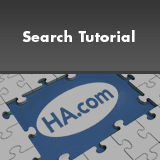 He has been providing expertise for Heritage's Music & Entertainment Auctions since 2004.